Situated on 40 glorious acres at the west end of Ocean Avenue, Castle Hill Inn offers guests a secluded retreat where luxury is paramount and relaxation is our hallmark. Stay in one of the hotel's extraordinary accommodations, which include mansion rooms with soaking tubs, refined beach houses with full kitchens, and luxury suites. While here, enjoy private beach access, take a sailboat out on Narragansett Bay, or explore the quaint shops of downtown Newport. Among Newport, Rhode Island hotels, Castle Hill Inn offers a private resort-like experience and extraordinary service. Read more about our historic legacy, which began in 1875, and discover the best hotel in Newport, RI today. Take right onto Thames Street (just past "Wave" statue). Continue down Thames to Wellington Avenue. Turn right onto Wellington Avenue. This is the beginning of the famous "Ocean Drive". At the first stop sign, turn right onto Harrison Avenue. At the second stop sign, turn right again onto Harrison Avenue. At the fork in the road, bear right onto Ridge Road. After going past the Coast Guard Station the road turns sharply to the right and then to the left. The Castle Hill entrance is the first driveway on the right. Follow the signs for Ocean Drive to help guide you through Newport. Take I-93 South, to Route 24 South, to Route 114 South, which becomes Broadway in Newport. Continue down Broadway to Washington Square. Take left onto Thames Street, pass Brick Market, then bear right to get to traffic light. At light, take left onto America's Cup Avenue (South), stay in right lane. From I-95 North, take exit 3A (in Rhode Island) to Route 138 East. Follow Route 138 over the Jamestown Bridge and then over the Newport Bridge. Take first exit off bridge (Scenic/Downtown Newport). Make right at end of exit ramp. At second light take right onto America's Cup Avenue. Stay in right hand lane. Take Bourne or Sagamore Bridge to Route 25 West, to I-195 West, to Route 24 South via exit 8A. Route 24 will merge into Route 114 South, which becomes Broadway in Newport. Getting around our 40-acre peninsula and across the water has never been easier or more enjoyable. Castle Hill Inn offers transportation opportunities through our partnership with Volvo and aboard M/V Mistress, Castle Hill’s own motor launch. Learn more about Newport, RI transportation at Castle Hill below. At Castle Hill, we aim to offer our guests an unparalleled experience in all aspects of their visit to our magical forty acres. 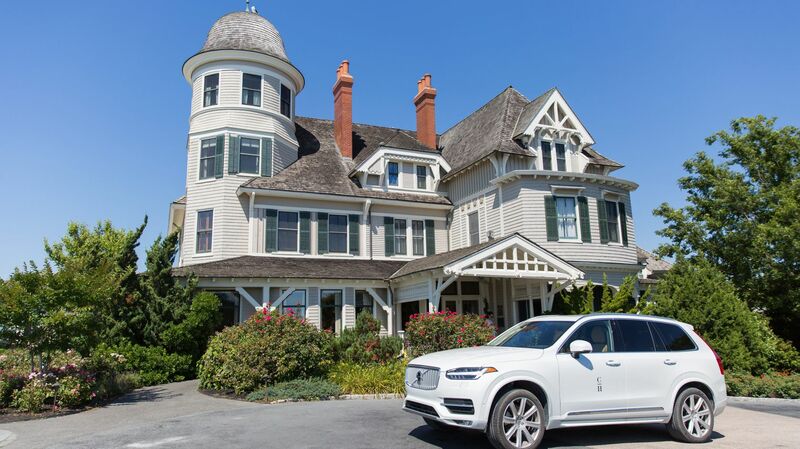 With this in mind, we are proud to partner with Volvo Cars as the Inn’s social vehicle provider and give guests the opportunity to experience Volvo’s XC90 and V90 Cross Country. Overnight guests of the Inn may test drive the Volvo V90 Cross Country for up to three hours at a time during their visit. Available seasonally May through October. For more information please call 888-466-1355. Since the city's founding in 1639, Newport water transport has been a principal method of travel to town, for both business and pleasure. In the summer season, as a guest of the Inn, now you too can travel into Newport aboard M/V Mistress, Castle Hill’s own motor launch. Hugging the eastern shoreline of Narragansett Bay and Newport Harbor, Mistress will glide by Gilded Age mansions, the New York Yacht Club, and Newport’s town skyline during the forty minute voyage. The launch departs from the Castle Hill Marina and returns from Perrotti Park. Each ride is $10 per adult; children 12 and under ride free with an adult. Tickets available for sale at the front desk of the Castle Hill Inn and the Pilot House on Bowen’s Wharf.